Characters are the lifeblood of any production. 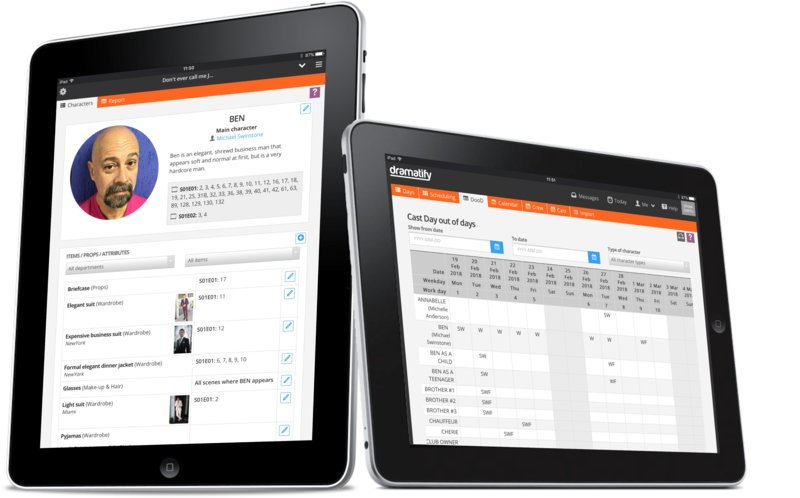 Dramatify automatically helps keeping track of all the details around your production’s characters, from which scenes they appear in and the cast, to any scene items belonging to them. Dramatify offers a wide range of character types, from fiction to non-fiction, entertainment and current affairs. In Dramatify, you add characters to a scene, scene items such as wardrobe and props to a character and one or more cast members to the character. Suddenly, you and your team have a wealth of information at your fingertips, and Dramatify automatically adds characters and cast in the call sheet. For creatives, you can flesh out the character with a concept image and a bio or description. After breakdown, we automatically add which episodes (if any) and scenes the character appears in. For drama, you can link not only an actor to a character but also stuntpersons, body doubles and stand-ins. For any other kind of non-fiction, entertainment, factuals, current affairs (or cameos) you can check a box to display that this person is themself. We have also extended scene items past breakdown. This gives you the option of letting the wardrobe, hair and makeup and props teams do their own breakdowns and add both scene items and scene item options to a character – with images, tags and star markings. The entire character list becomes a working document which clearly shows which roles are cast and which are underway. It is also the basis for credits at the end of the production. In the Character & Cast report, you find production days, pages, episodes, scenes, sets, location and unit bases for each character and cast. You can also filter and customise the information with a few clicks to get the view you want – for yourself or to send to others. Dramatify also naturally contain a Day out of Day report for Cast. With the scene list (Stripboards > Scene list) you quickly create any continuity reports you need! Top image original by Karen Roe / Flickr (CC BY).